EZBankruptcyForms.com bankruptcy software allows you to prepare your own paperwork accurately and save time for as little as $44. Preparing your paperwork is a major step to filing bankruptcy yourself, but our mission is to give you enough understanding of the bankruptcy process for free so that your hardest hurdle would be completing the bankruptcy forms accurately, keeping you from feeling otherwise lost in the process. 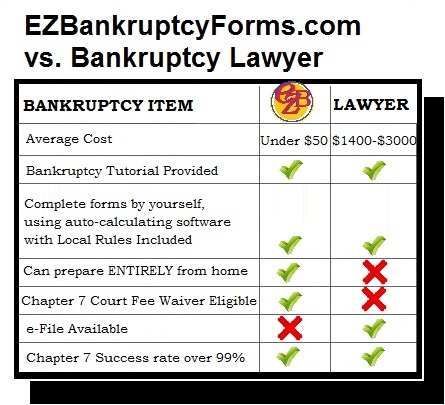 EZBankruptcyForms has provided, FOR FREE, both CHAPTER 7 BANKRUPTCY WITHOUT A LAWYER and CHAPTER 13 BANKRUPTCY WITHOUT A LAWYER tutorials, to coordinate all the upcoming steps, making the only hurdle to overcome the actual preparation of the paperwork, making our bankruptcy software a comparable value to hiring a bankruptcy lawyer..
Our forms are savable, can be used on multiple computers, and auto-populate and auto-calculate (three things the free forms on the government website do not). EZBankruptcyForms bankruptcy software is guaranteed to be current through six months after your 2019 purchase, will be superior in saving you time as you prepare your bankruptcy paperwork for either Chapter 7 or Chapter 13. Our software comes in fillable pdf format, that will populate and calculate correctly if you have the free program called Adobe Reader installed on your computer or device. To find out if your device is currently capable of running our software, please download our "FREE MEANS TEST". EZBankruptcyForms online bankruptcy package looks EXACTLY like the forms you will be submitting to the bankruptcy court, and is completely downloadable to your computer with no .exe files to install. If can view the "Means Test" described above, you already have all the tools installed to begin. EZBankruptcyForms gives you the ability to start on your bankruptcy forms one day, save at any time, and complete the forms at a later date for as little as $44. ORDER EZBankruptcyForms BANKRUPTCY SOFTWARE HERE. If you purchase today and the forms become outdated within six months, we'll send you a new version at no charge. The bankruptcy software looks just like the free government forms, but perform differently (ours auto-calculate and the free forms don't). The bankruptcy software is compatible for PC, Mac and tablets that have the free version of ADOBE READER installed. The software is NOT compatible for mobile phone use. There is no licensing agreement for our software, meaning you can use it as many times as you want. EZBANKRUPTCYFORMS.COM IS THE LEADER IN BANKRUPTCY SOFTWARE FOR CONSUMERS. EZBankruptcyForms.bankruptcy software has taken the free government pdf bankruptcy forms available and modified them to auto-calculate throughout. No more totaling by yourself. No more entering and re-entering information for pages on end. We have supercharged the bankruptcy paperwork so you can prepare your bankruptcy case on your own accurately and save time for as little as $44. The bankruptcy software is compatible for PC and Mac that have the free version of ADOBE READER installed. The bankruptcy software is NOT mobile or iPad compatible.